Let Us Make Your Custom Online Print Portal | Deschamps Printing Co. Inc.
Did you know that Deschamps Printing can create your own custom print portal? Let us create a custom web-based print portal for all of your printing needs that you can access 24/7. Not only is it easy to use but it will save you money too. Let us print and inventory your items, then pick and pack as you need them or we can put together a print on demand program for you. 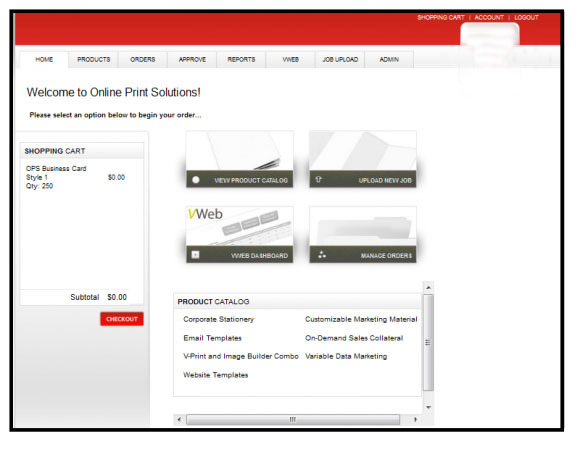 Your print ordering habits will determine which is the best solution for you. Contact your sales representative to see a demo and make your ordering process that much easier.